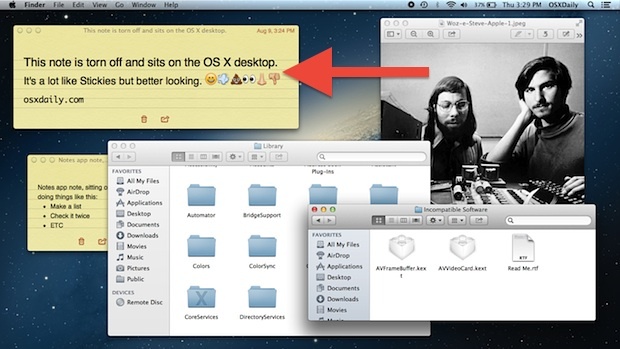 The new Notes app in Mac OS lets you tear off notes and to float over the Mac OS X desktop. You can think of this as the Stickies app on steroids, and not only does it look better, but you can share directly from the Note. Best of all, if you have iCloud set up with Mac OS X and iOS the pinned note will automatically update when it’s edited from an iPhone or iPad via the iOS Notes app. Again, you’ll need iCloud set up for this to work, so if you don’t have that configured yet in Mac OS X and iOS do so now. Of course that feature works the other way around too, meaning if you edit the floating note on the Mac desktop it will sync the changes immediately to the iOS versions too. On a related note, if you don’t like the garish default Notes font, here is how to change it on a Mac and also in iOS. While yes I can drop it on the desktop, I must leave notes running for it to stay, and once I close the main notes window it is not intuitive or easy to reopen the main window. Also restarting notes does not leave the desktop note in place, you must ‘tear’ it off and place it each time, in my opinion not intuitive or helpful, at least not as helpful as the tip suggests. You can also open notes in separate windows by searching for them with Spotlight. For some reason, Spotlight also includes notes that have been deleted from the application but still have files in ~/Library/Containers/com.apple.Notes/Data/Library/CoreData/ExternalRecords/*/NoteBody/_records/*/. Not surprisingly, works the same for Reminder app. Double click a list (“To Do Today”) on the left pane and it becomes a floating list on the desktop. Brilliant, didn’t notice that. Thanks! Unfortunately doesn’t seem to persist across a restart of the app. Unfortunate – but I’ll live with it. Notes are too unstructured for my brain – Reminders give me enough – but not too much. The problem for me is there is no way to SAVE the note, This means a copy of a note somewhere that is untouchable, The cloud constantly syncs, but if you are on say your iPhone and open the note. If you accidentally select a paragraph and erase it unwittingly; it instantly throws that section away on all copies. It’s gone. In Lion each note that you changed was email to you daily so you had a COPY from yesterday. That feature is gone. The cloud amplifies an error. Did you know there’s an “Undo” feature on the iPhone? After you deleted something, shake your phone and the option will appear. Does not work for me – where is Note app? I have Lion 10.7.5??????????? Nothing happened when I open Notes in iCloud – no way to get it to desktop. Try double clicking the Note in the list. How do you re-attach a note back into the notes app? I’ve got one floating on the desktop now that I would like to put back – Maybe it’s not possible? If I really did tear a note out of a notebook in real life I couldn’t put it back in short of taping it or stapling it. Just close the note, it should appear in the Notes app. Michael Steeber was here. Mike loves this tip.